Most drivers in the sprawling metropolis of Los Angeles rely on Google Maps, Waze or their in-car GPS system to navigate the city, but not that long ago, drivers relied on a different type of North Star — one that lived in almost every backseat or glove compartment: the Thomas Guide. So what happened to the Thomas Brothers and the guide company that bears their name? And what was the guide’s significance to Los Angeles? Let's take a look. Five different Thomas Guides from the Los Angeles Public Library Central Library's collection. Thomas Bros. Maps was established in Oakland in 1915 by cartographer George Coupland Thomas and his two brothers. What began as a company that made wall maps expanded into block, community and tourist maps. Suit pocket sized Thomas Guide from 1945. In 1940, the company moved to Los Angeles at 257 South Spring in Downtown L.A., where it grew its inventory. 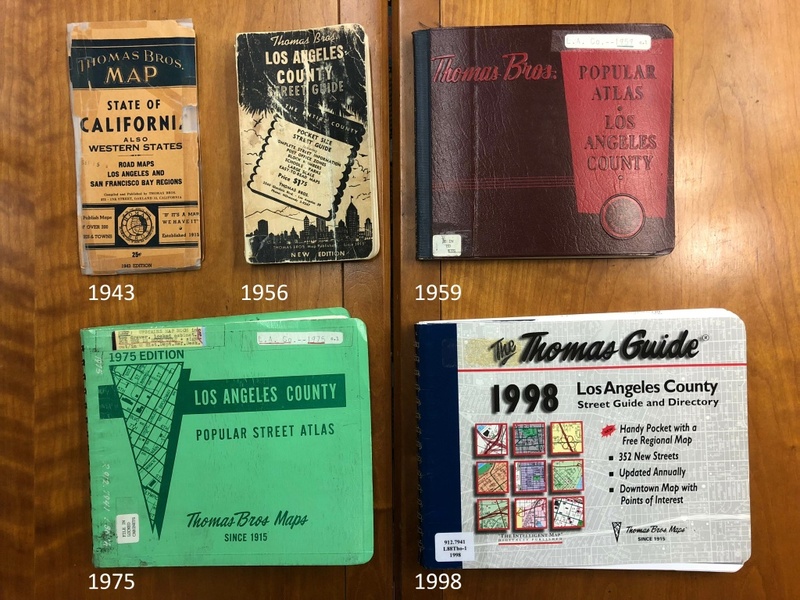 Glen Creason, the map librarian at the downtown's Central Library who takes care of a collection of nearly 250 Thomas Guides, said they initially made fold-up maps that could fit into a '40s men's suit pocket. In 1945 they started the book format that we still recognize today, sized to fit inside a glove compartment. 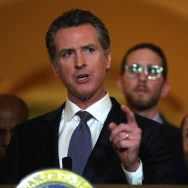 Creason said there were other mapmakers in Los Angeles, most notably the Automobile Club of Southern California and Gillespie's Guide. 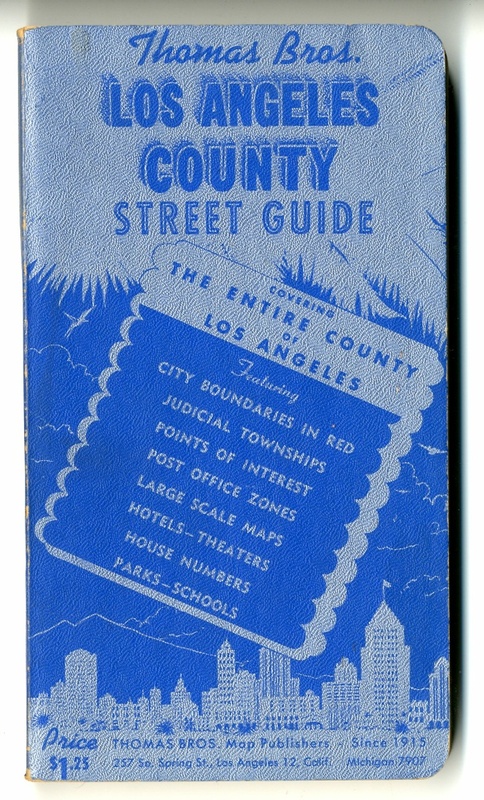 Cover of the 1946 Thomas Guide. There were also smaller companies that sometimes tried to copy Thomas Bros. Maps' cartography. So Thomas Guides put in fake streets or towns, so they could catch copycats. 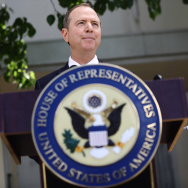 "There were a lot of counterfeit operations out there... making smaller maps using our data," said Todd Nathanson, grandson of Warren Wilson, former president and CEO of Thomas Bros. Maps. "And we would put fake streets of people's [employees] kids' names...pets' names...in little cul-de-sacs, and that was one way we would be able to keep the copyright." In 1955, George Coupland Thomas died with no heirs, leaving the company to his widow. That’s when the company was bought by its attorney, Warren Wilson, and his business partner. 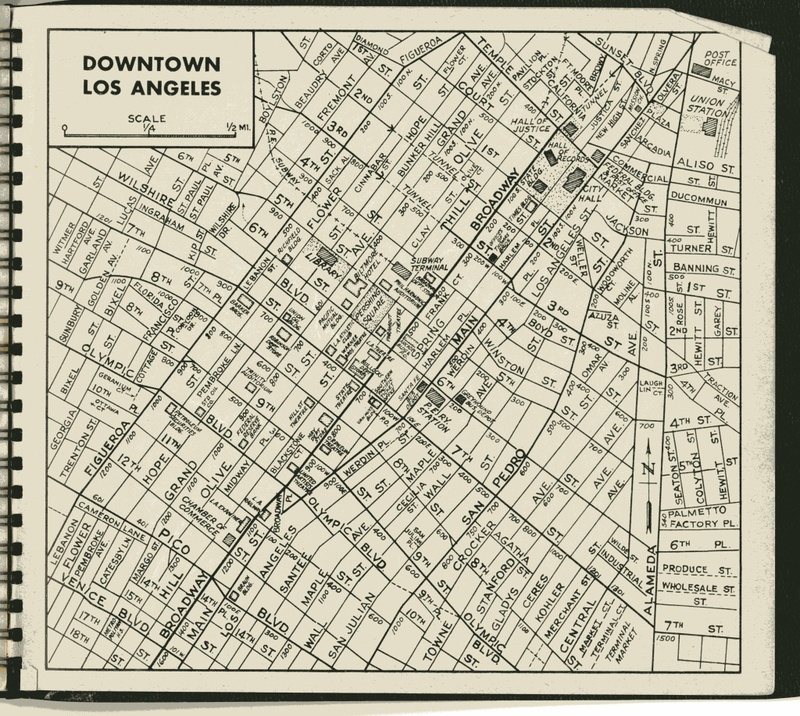 The Downtown Los Angeles overview from the 1946 Thomas Guide. The map company continued to grow in the 40 years under Wilson. In the 1970’s, he bought out the whole company and moved it to Irvine. Even as Thomas Bros. grew to dominate the map market on the West Coast, many Angelenos didn’t realize that Thomas Bros. was a fairly small company with less than 250 employees. 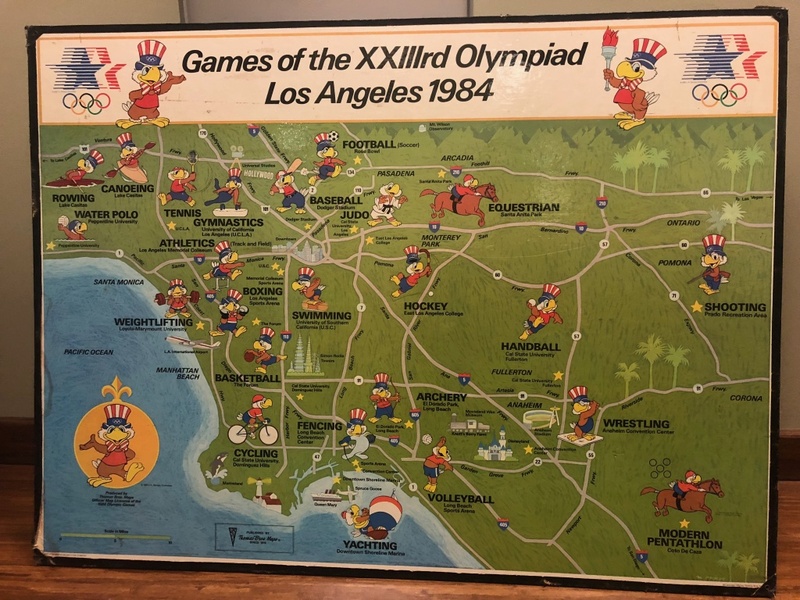 The 1984 Thomas Guide Los Angeles Olympic Games wall map. 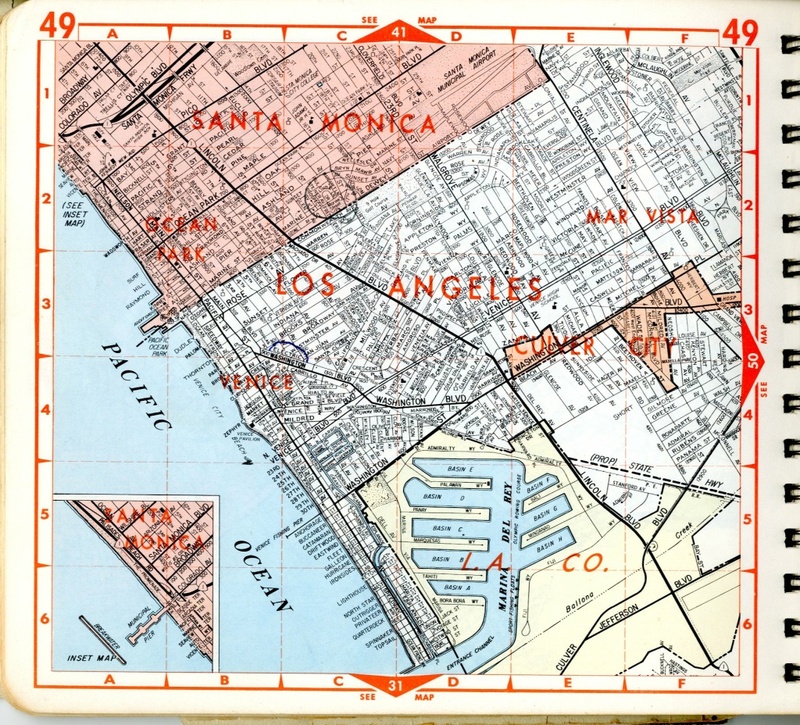 Thomas Bros. Maps were the official mapmaker for the Olympics in L.A. Even though Thomas Bros. Maps made strides in the digital landscape, and even sold its guides via CDs, the rise of digital map sites changed the game for physical mapmakers. At the same time, in the 90s, the Thomas company made an unsuccessful foray into the east coast. 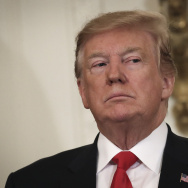 According to Nathanson, the attempted entry into the beltway was costly and ultimately the company didn’t have the brand name or resources to compete with already established map companies. 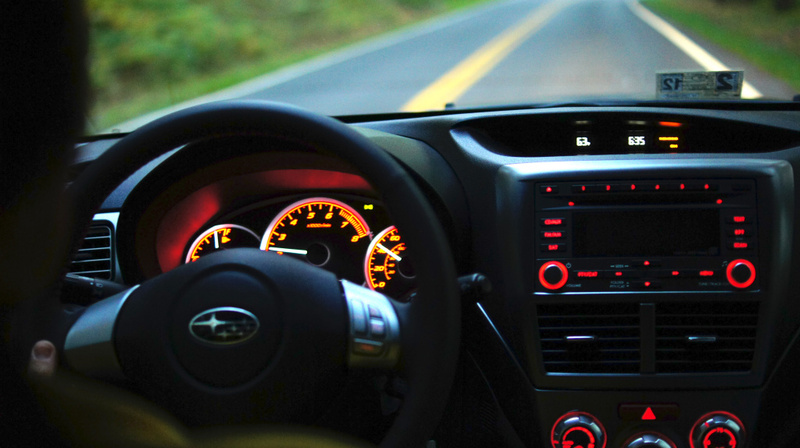 Meanwhile, in-dash car navigation systems and websites like MapQuest became more popular. A larger map and Atlas maker called Rand McNally had been trying to buy Thomas Bros. Maps and Nathanson said his grandfather could see the writing on the wall. In 1999, Wilson sold the company to Rand McNally. 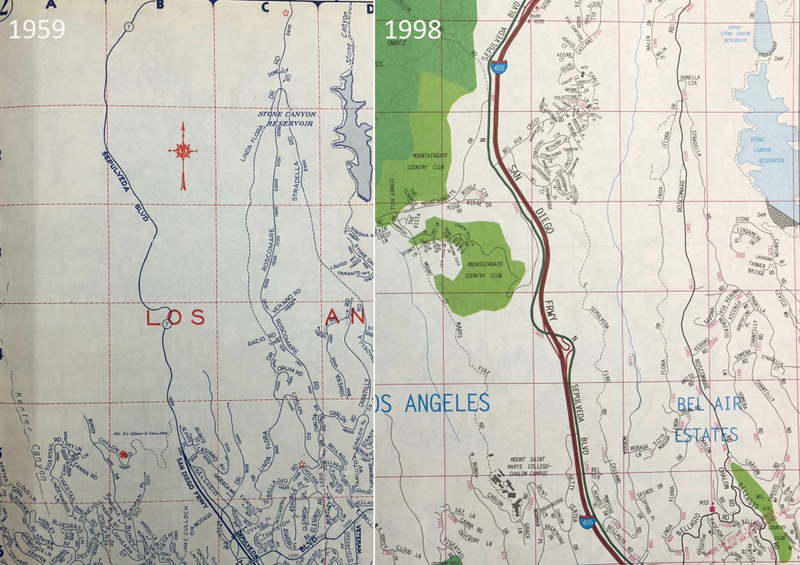 A side-by-side comparison of Bel Air and surrounding areas from the 1959 and 1998 versions of the Thomas Guide. Construction on the 405 Freeway began in 1964 and was completed by the time the 1998 Guide was released. 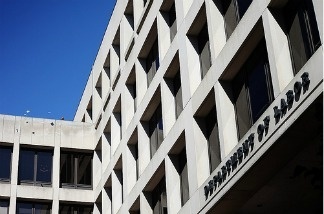 Nathanson, who had worked in various departments at the Thomas company while in college, and then worked in sales after graduating, stayed on for four more years after the company was sold. He said it has since been bought and sold by venture capitalists. Some versions of the Thomas Guide can still be bought, but for the most part, they’ve faded from prominence. Why did Thomas Guides mean so much to Angelenos? “I think they [Thomas Guides] are way more important here than they are in most cities,” Creason said. Los Angeles is bigger than most cities, he said. When automobiles went into mass production, it was the Automobile Club of Southern California, not the government, that put up the first street signs, but there was still a comprehensive map needed to make the city navigable. That's where Thomas Guides came in. I moved to L.A. in 1994 and loved my Thomas Guide, which helped me really learn L.A. Despite using online maps now, I still have my VERY well-worn Thomas Guide. When my car was broken into a few years ago, the only things that weren't taken were my Thomas Guide and my umbrella! 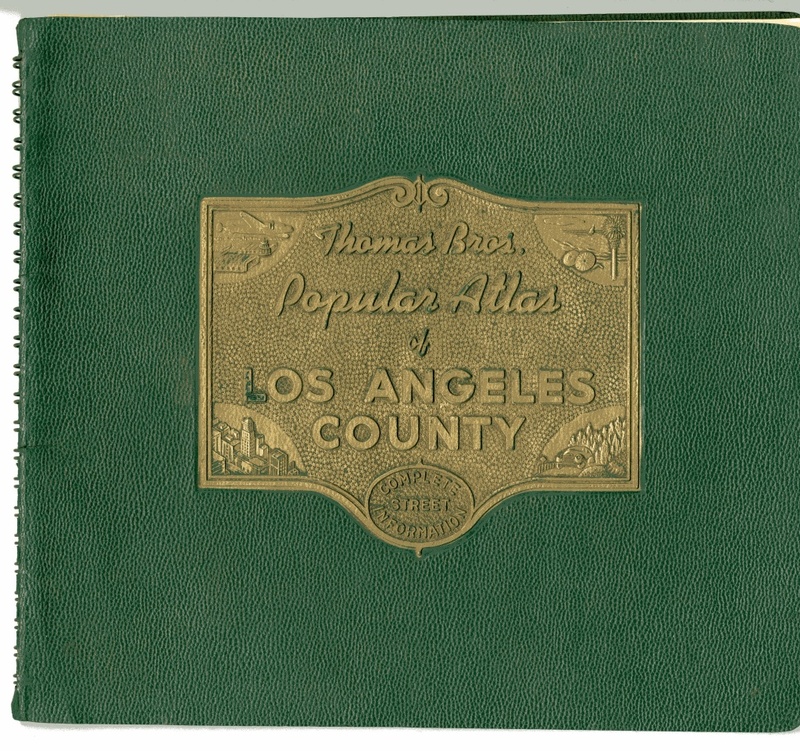 On @AirTalk @LarryMantle: I love, love the Thomas Guide - learned LA/OC with it. 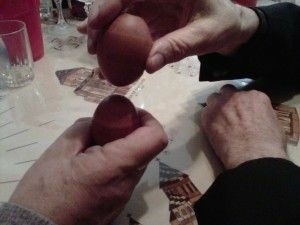 Dad played a game with me at the kitchen table. How to get from pt A to pt B, go! Such fun memories. I love maps to this day & know the city streets from that game. Still have the Guide. I was new to LA in 1987, around that time I worked driving for a payphone company! The Thomas Guide was indispensable to my route planning, as I traveled from Santa Ana to Ojai retrieving the coins and fixing phones. Thomas Guides and Pyphones - Both anachronisms today! 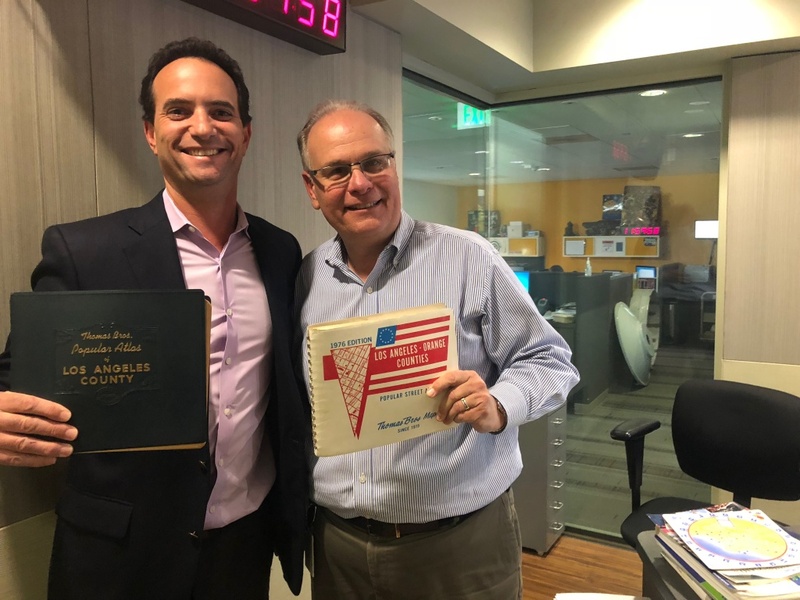 Todd Nathanson, grandson of Warren Wilson, former president and CEO of Thomas Bros. Maps, and Larry Mantle in the studio. 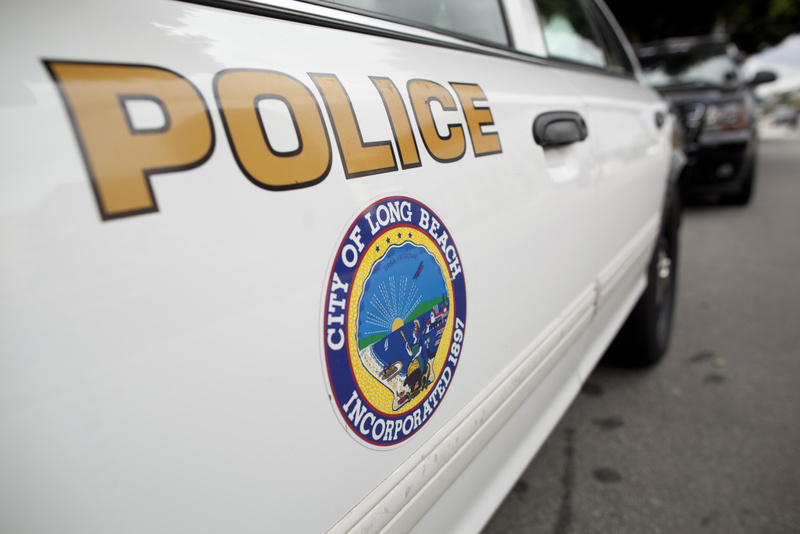 Should Waze be made liable for neighborhood traffic woes? Toys ‘R’ Us isn’t just a business. For many, it’s a place of childhood memories. What are yours? Dude, where’s my car’s driver? New DMV rules on driverless cars raise the question: How would you react to a car with no driver?